"Portable movie maker to create videos made of your photos and videos anywhere"
Windows Live Movie Maker is a special application capable of creating unique movies and presentations made of your photos and videos, which popularity has grown thanks to the simplicity it can be used with. For that reason, the Lord Devrexster team thought that it would be a excellent idea to give people the possibility of taking it anywhere. Here we present, Windows Movie Maker Portable, a standalone version that features the possibility being taken to every place in a USB drive. This portable version brings 76 special effects and 147 transitions, a great bonus to have in mind that differentiates it from the original application. Drag and drop to the timeline in order to import your images, videos and videos captured in real time. There are many features that you can use to enhance your creations such as special animations, visual and transition effects and background music you can add according to the occasion. 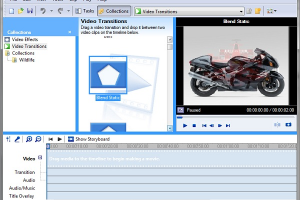 You can make your presentations more special by adding tittles and credits at the beggining and end of your creations. Once you have finished working, you can use the preview window to check how everything is looking. This tool is even able to convert all your videos into 480, 720 and 1080 high definition formats. If you wish to share your creations online you can upload them to YouTube directly from Windows Movie Maker Portable, or else pass them into a DVD disc.